Catholic News World : A Priest is told to stop Defending Pope Francis - his Response "Before you get up and give a sermon on the failures of other church leaders, please, let us visit your parish first..."
A Priest is told to stop Defending Pope Francis - his Response "Before you get up and give a sermon on the failures of other church leaders, please, let us visit your parish first..."
A brother priest invited me to "take off the blinders" which cause me to defend the Pope during this time of scandals. Yet I do not believe I am blind to who Francis is. To have blinders about Francis, is to imply that a person does not see the Pope's faults, or his failures, or his inadequate responses to the problems of sexual abuse by bishops or priests. In all honesty, I am quite capable of seeing the bad in others, the sins of others, the problems which make other people "fall short of the glory of God" (Romans 3:23). If I wanted to, I could write long essays about the things I dislike in you, or you, or you. But why publish these things? To prove that the pope, and others, are sinners? That needs no proof. Why write about this on Facebook? So that other people will join in picking apart the deficiencies and blunders of the pope or certain bishops? Is that supposed to give me a happier day, with more satisfaction in life? And as it is said in Latin, "cui bono?" 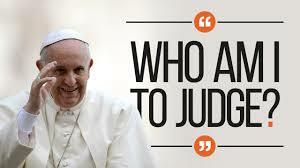 Who stands to gain by me passing these judgments and warning others about Francis? Will it make me look like a better priest, a warrior of good doctrine, a man of "holy bravery" who stands up to the pope? I am a priest with my own failures. I have never broken any vows of ordination, but I am far from being appointed by God to "warn all of you" about the pope. My own parish does not run smoothly as I would like. My own parishioners at times are not visited and attended to as much as they should be. There are people away from the fold, whom I have not yet brought back. The priest who taught us homiletics in the seminary once said, "Before you get up and give a sermon on the failures of other church leaders, please, let us visit your parish first. Let us interview all your employees and volunteers, ask them how they are treated and recompensed for their work by you. Let us review the neighborhoods around the parish and see how many of the lost and lonely have been contacted by you and lovingly invited back to the Church. Let us ask the most poor and downtrodden of the city, whether they feel as if your parish is a shining city on a hill?" (Matthew 5:14). So to answer that priest's comments--no, I do not have blinders on. I see failures quite clearly, including my own. And as I know a visiting committee would find many deficiencies in my own leadership, of my own parish, I am not about to get on the soapbox of Facebook and preach about the deficiencies of the pope's leadership of 1.2 billion Catholics.